Seek permission to work. Acquire the necessary permits. Establish a remit. Documents to regulate creation. 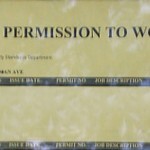 Permission To Work is an exhibition designed to challenge and interrupt pre determined ideas about what defines living space and how art works can negotiate the everyday domestic experience. For the artist the everyday is to dream and often to dream is to work. So the concept of live / work / display space is a fluid one without clear boundaries, limits or territory. Where does living space start and work place stop? Where does studio end and exhibition space begin? Permission To Work brings together eight artists and invites them to create an exhibition in the style of Schwitters Merzbau or a Kunsthalle. This exhibition presents a variety of positions / outcomes / projects juxtaposing performance pieces, site specific installations and interventions to create a gesamtkunstwerk or total work of art. By seeking “permission to work” we have granted artistic license to play with the fabric of our home and produce art that re-contextualizes the living area as exhibition space.